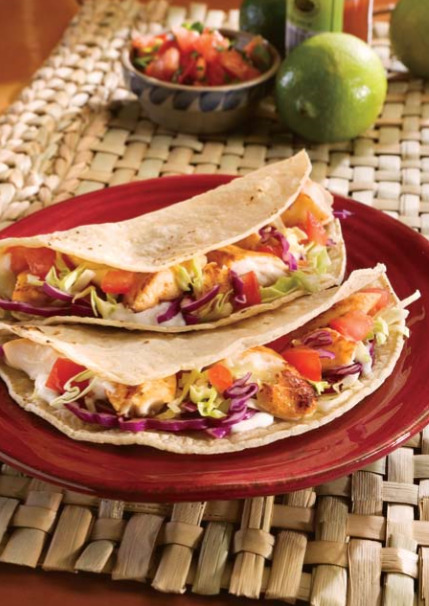 Make your own restaurant-style fish tacos at home for a light and healthy dinner. In a medium bowl, combine fish, olive oil, lemon juice, and seasoning mix; pour into a large skillet. Cook, stirring constantly, over medium-high heat for 4 to 5 minutes or until fish flakes easily when tested with a fork. Fill tortillas with fish mixture. Top with cabbage, tomato, sour cream, and taco sauce. Serve with lime wedge, if desired.